I know that one post won't properly sum up all the knitting I've done since Christmas time, but I'll attempt at least to give you a rough overview in this two-part blog post. Using my rudimentary photoshop skills, I'll try to sort of group projects into themes. I've included links to my Ravelry projects pages for each of these in case you want more information. The first theme is socks! 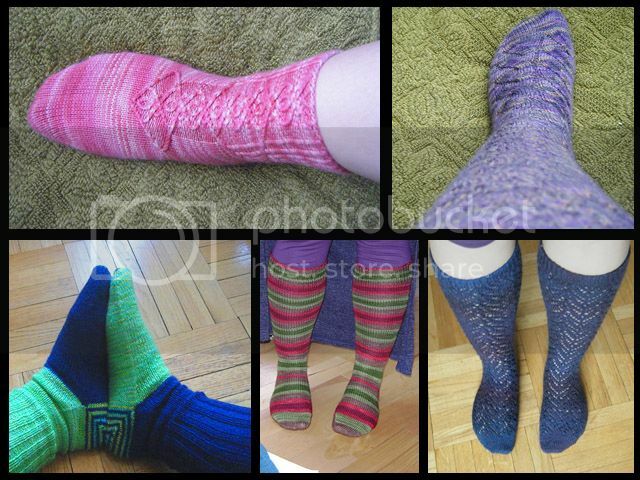 I love knitting socks, and I love wearing hand-knit socks. They're great portable travel projects and can be as complicated or as simple as you like. And nothing is as warm and squishy as a hand-knit sock hugging your toes. Clockwise from the top left, we have my Twisted Mockery socks knit in a mystery gifted yarn, my Nutkins knit in Austermann Step, my Johanna socks knit in Jojoland Melody Superwash, my Turtle Toes socks knit in Turtlepurl Yarns Striped Turtle Toes, and my Double Helix socks knit in Cascade Heritage and Fiber Charmer Chris Sock. 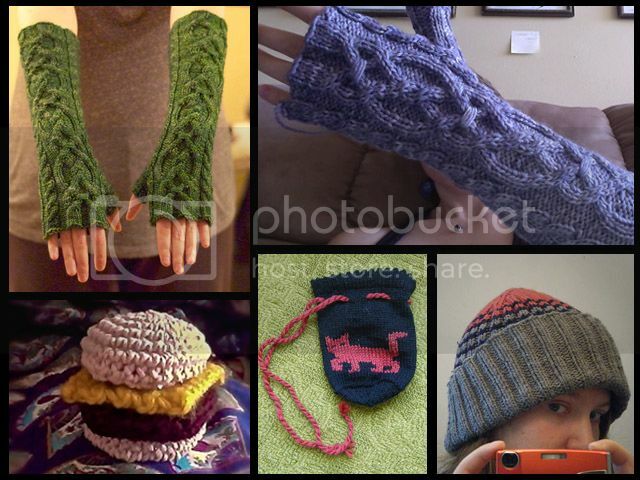 The next theme is stuff I've been knitting for others! Again clockwise from the top left, we have Evenstar gloves I knit for Ellie in madelinetosh dk, Evenstar gloves I knit for Daphne in Araucania Nature Wool left over from my Luxe Cable sweater, a toque I knit for Yeddi in various leftover yarns, a super cool dice bag I knit for Miranda in a mystery leftover sock yarn, and a catnip-filled hamburger I crocheted for Nick's kitty out of random scraps. You probably noticed that I've knit the Evenstar pattern twice in the above picture, and let me tell you, I'd gladly knit it up again! The cables are just so addictive in that pattern, and the result is just stunning. The first pair I knit in the madelinetosh was so amazing (that yarn is worth every penny) I was immediately hooked. This was actually the third time I'd knit that toque pattern as well, and I had knit a dice bag for myself before I knit this one for Miranda. I used to hate knitting the same pattern twice, but I guess I've now found a collection of patterns that I can fall back on when I want to knit a certain type of gift. And next up we have patterns I've test-knit for the Happy Seamstress. Joanna has been very prolific over the last few months, and I've been lucky enough to get first dibs at knitting them up! 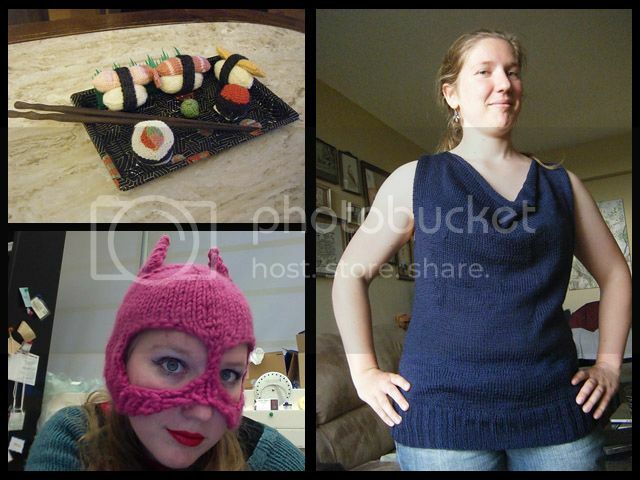 Clockwise from top left, we have sushi I knit from a kit Joanna had given me, the Cafe Tank which I knit from Knitpicks Galileo, and my bright pink Bat Hat which I knit from Bernat Roving. The latter was part of my Halloween costume. I was a pink cat woman type thing. By the way, Joanna is having her patterns featured as part of the Independent Designer Program on Knitpicks, so you should definitely check that out! There's more, of course... Next time I'll talk about baby gifts, stuff I've knit for myself, and wedding presents. Hopefully that will cover almost everything!